If you look at your life, how well are you doing in respect to your work-life balance? Do you feel that you are too busy to take a regular vacation? Do you struggle to find the time to take an afternoon off? Have you gotten into the bad habit of eating your lunch at your desk? Do you work more than 10 hours a day? Do you make yourself available day and night? Please know that this is not normal. You are a human being and you need to look after your mental and physical health. Do not allow anyone to take advantage of you. It has been said that people who don’t set boundaries have little to no self-esteem. Who do you think is responsible for setting boundaries in your life? The only people who don’t want you to set boundaries are the ones who benefit from you having none. The only reason why you’re dealing with something that you don’t want is because you never take the time to think about what you want. Please know that you can be in control of your life. Work hard, be dedicated and do the best you can but make sure to set clear boundaries in your personal and in your professional life. You have to find out what you want and you definitely have the right to set your own limits. 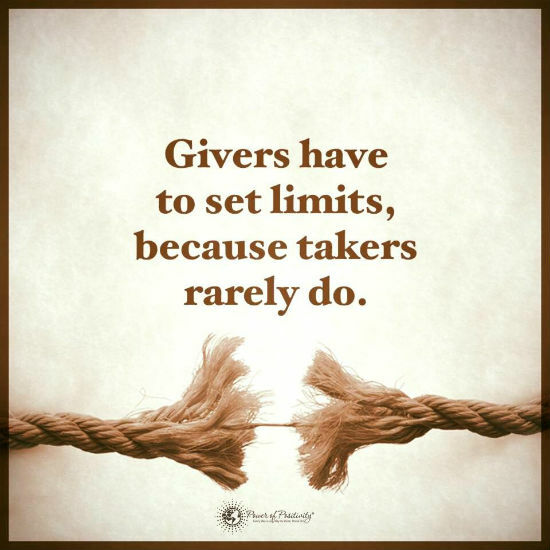 Here is a great TED Talk on this topic: Are you a Giver or a Taker?